So you are in the first throws of planning! You have made lists of lists of the things you need to organise and you don’t even know where to start? Well surprisingly your stationery might be a good starting point, because much of what you will go on to choose for your wedding will largely be centred around this in the future, the date being your first priority. If you aren’t sure how to even go about organising your stationery then don’t worry because today we have invited Lyndsey & Erica of Anon Design to share their top tips. By now you will have hopefully chosen a date and you will want to start inviting your guests. A massive part of injecting your personality and style can come from your wedding stationery. It’s the first aspect of your wedding your friends and family will see, so you want it to hit the nail on the head and with impact. As wedding stationers we’d want to work with you to make your style unique and personal. You might have already found the perfect collection, or you might see elements that you love. If you want something bespoke, don’t worry about how quirky you think an idea might be, suggest it to your designer. It might just be possible and will be sure to create something fun and long-lasting! Through past experience, every couple is different – in their style but also in their approach and their needs. 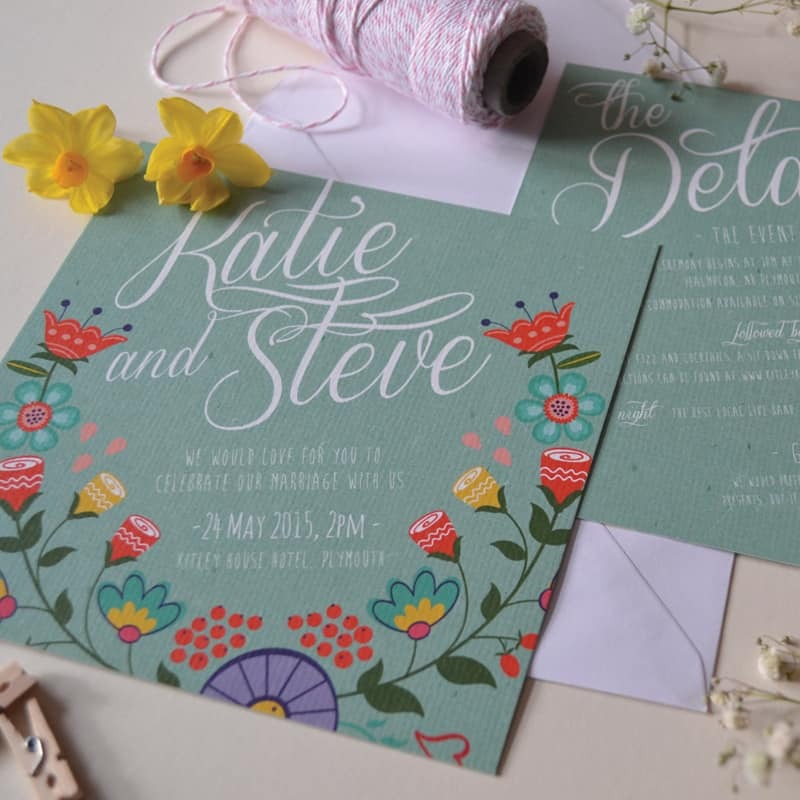 And so they should be, so here are our top tips on picking your perfect wedding stationery. Nautical, floral, festival… Whatever floats your boat? It might just be a strong colour scheme or maybe something that fits with the venue that you have forever had your sights set on. It is possible to create stationery that ties in with whatever your wedding theme may be, even to combine several elements. 2. To Save the Date or not? We find this is unique to each couple and often depends how far in advance your wedding is planned. If you have set a date for a couple of years away, or perhaps if you are getting married abroad and know it might be tricky for guests to attend – send a save the date to give them as much notice as possible of the wedding date to ensure that your nearest and dearest can celebrate with you. This also provides another sneak peak at your styling! Couples often use a save the date to think even more outside of the box – make it unique. Rather than a simple card it could be a package, a sweet, something physical… something that they can save! 3. How to Navigate Wedding Invitation Etiquette? Things like wording often get couples stumped. Should they go formal/informal, traditional, humorous… and we are often asked what the done thing is? Our advice is always to use words that speak from your heart and fit with your day. If you were planning a super traditional wedding with all the frills, then the formal approach is definitely for you. Like a formal request for the pleasure of your company from the bride’s parents. Whilst a more relaxed vibe will warrant only first name terms – Sarah and James would love for you to celebrate their marriage with them. Or do away with tradition altogether with a ‘Come party with us’ approach! We were recently asked how to address place name cards – with a ‘Mr Hill’, a ‘James Hill’ or a simple ‘James’- personally we’d suggest using first name basis so ‘James’ would do nicely. Ultimately the decision is yours to make. If you and hubby to be have always called James by the nickname ‘Hilly’, perhaps using this will mean so much more to all of you. There is a complete range of elements on offer in wedding stationery these days. From before the event, to on the day to post wedding thank you’s. How much is right to include? Well, you guessed it; again this is down to you and the approach your whole day is taking. It depends how complex your day is and how much information you need to provide guests with. In this digital age more people are turning to less formal approaches to invitations – digital save the dates emailed over to guests, physical packages with details written on sweets, even video invitations… this depends on you and your guests. Are you a traditionalist at heart, do you love to send, receive and open post? Will your guests be able to easily receive and send digital formats? You may need to think a little more sensibly at this point about whether your guests can receive certain invitations, but it is definitely another way to inject some personality and fun into the proceedings. And like us, most stationers would be happy to work with you to create something unique. The digital approach is another way to save some pennies too! Work from the heart, speak your mind, be unique (or not if this suits you best – a big thing is to not feel you have to create something out of the box, be comfortable in the box! ), and be happy! If you don’t immediately see what you like in a stationers range, don’t let this put you off. They will be completely happy to tweak designs to suit your theme, they will have many more ideas in the archives (and in their strange creative minds! ), and anything not currently in existence they would be more than happy to create. You can see the current ranges at Anon Design… and if you have any questions chat at hello@anondesigner.co.uk! Good Luck with choosing your wedding stationery!